All 12 pages from last year’s Beaded Journal Project are started, 9 of them are completely done with the beading. However, I am still struggling with how to display them or back them/finish them. At first I was planning to make them a big book together, then as little shrines with equally beaded doors that closed. I tried a number of different ways to make the pages sturdy enough to stand on their own, but flexible enough to open and close. I tried thick interfacing, felt and quilt batting of different thicknesses, these were great for opening and closing the doors, but didn’t work at all for standing. Then I tried some card stock, cardboard and finally mat board. These were either too thin or too thick. I thought I had it all figured out after Robin’s class, but I can’t seem to make it work with the odd shape. Besides, where am I ever doing to display them where I have 12 podiums that are high enough to be able to examine the details. My next plan is to try and turn them into a wall hanging, still keeping them in the groups of three that were part of the original plan. 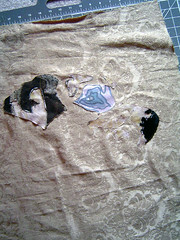 But because I have already turned the edges and backed some of them I am not sure how I will attach them. 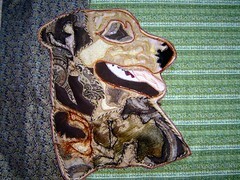 I am thinking perhaps reverse applique. I auditioned some groupings and some backing fabrics. It seems that a simple black will be the best choice, other colors will detract from the work. This is June’s page, quite a difference from the beginning. 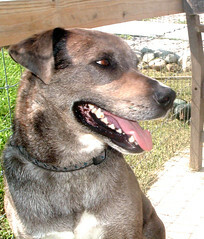 June is the end of the school year so it is very hectic, closing up the classroom and getting ready for the summer. 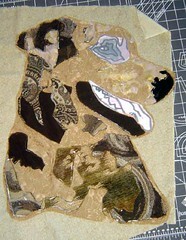 I created this fabric from a doodle I did in my paper art journal at my April art retreat. I scanned in the doodle, then mirrored it in photo shop, then printed it out on fabric. I used a lot of new techniques I learned from some beading books that I acquired, and then adapted to my own style. Here are the remaining ones that need to be beaded. This one is July. Spending time in my garden is the main thing that I enjoy during the summer months. This one is still very raw and has no bead work yet. But it is still part of the plan. This one is August. I have been training for a triathlon all summer and August is the heaviest training month. Still need to get beading on this. I am really pleased with how the beading parts are progressing (although slowly) and I am getting really excited for the next round. Here are some things I learned from the first round, the reading and research on beading that I have done in the process and my class with Robin. 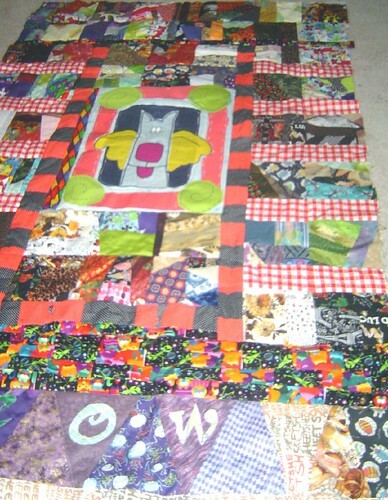 Quilting and including batting layers are not necessary. In the class with Robin we just used paper as a backing . This made it easier to turn the edges when the beading was done. The thick layers made this part very difficult in this first series. 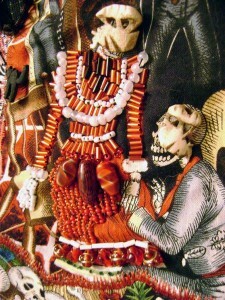 Printed fabrics with pictorial images will limit the beading. Because I was new to the whole thing I used some printed images to guide my beading, almost like a coloring book I beaded the images. 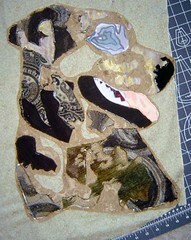 This was fun and was a good way to start, but it is also very freeing to move to non-representational fabrics. An Ott light is a GREAT advantage. A bugle bead pathway is a great way to move forward when you are stuck. 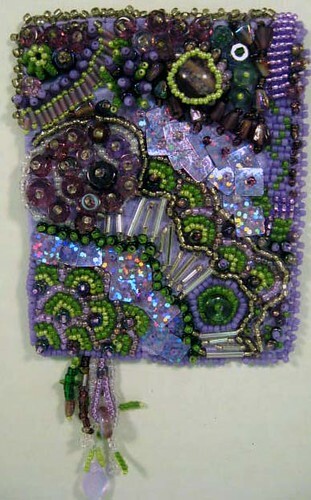 So a few days from now is the NEW year and a new round of the Beaded Journal Project. Will I pick a smaller size, an easier shape, neutral farbics? I am really leaning towards dolls! 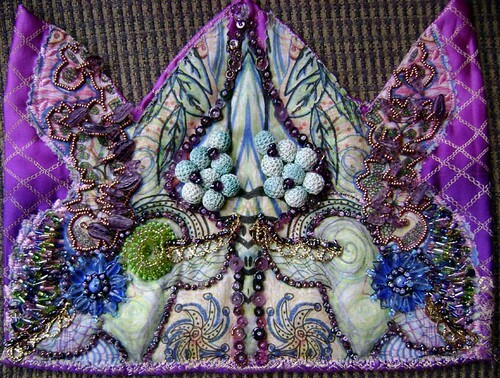 This entry was posted in Bead Journal Project, Challenges and tagged art, BJP, challenge, Challenges, journal, quilting, sewing, WIP on December 29, 2009 by Sheba. 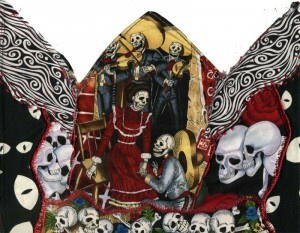 Day of the Dead theme with a wedding proposal scene. Beading on her dress almost complete. Two days of beading after one day of sewing so far. This entry was posted in ArtSoMoFo, Bead Journal Project and tagged art, beading, BJP, Day of the Dead, Halloween, journal, October 2008, quilting, sewing on October 8, 2008 by Sheba. Pages 74- 77 go over the methods of pleating using a “perfect pleater” (Another project from my challenge book “Exploring Textile Arts“) I looked around a bit for said “perfect pleater” and they are a bit hard to find and more money than I wanted to spend for some experimenting. So I decided to try doing pleats the old fashioned way… just folding and ironing! I think the pleater would have helped hold the ironing together in the transition from ironing board to sewing machine. The book shows ironing on some facing to the pleated piece and then removing it from the pleater in a now stabilized single piece that won’t unfold on you. 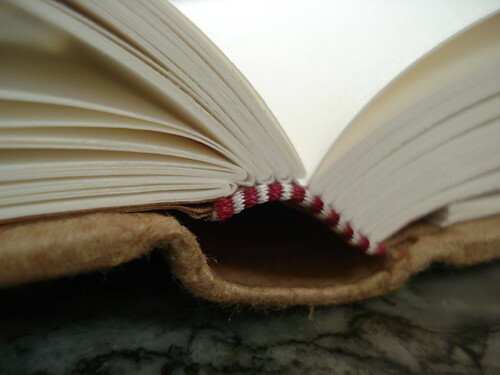 The arsty framed examples of pleating in the book used some decorative stitching to have the pleats fan in different directions. So I gave that a little try. Again I used scrap fabric (some old vintage stuff that I am QUITE sure was from a dress my grandmother wore.) I am thinking I would like to use this technique for grass areas in an upcoming piece or even a picket fence. 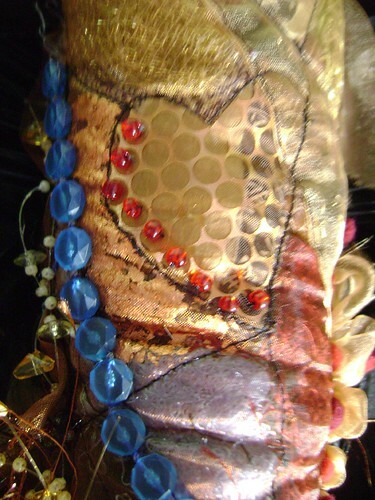 It does have a nice texture and dimension to add to a piece. This entry was posted in Fiber Goodness, Jen's Challenge 2008 and tagged challenge, collage, Fiber Goodness, quilting, sewing, techniques on June 7, 2008 by Sheba. 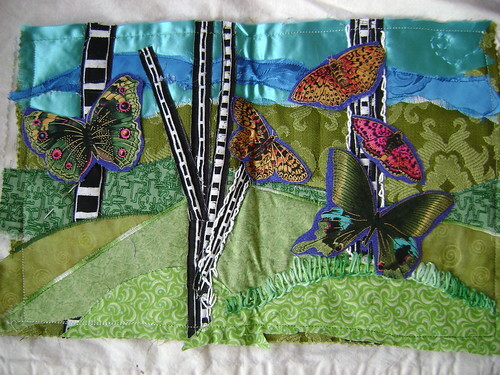 This is the first of many experiments from “Exploring Textile Arts” that I am working on for the month of June 2008 for Jen’s Challenge. It uses Decorative Bobbin Sewing. (pg 88) The point behind this style of sewing is to use thicker fancy and metallic threads that ordinarily wouldn’t go through the eye of a needle. You put the fancy thread on the bobbin and sew from the bottom. I don’t actually have any of these fancy threads and I am really in a USE WHAT YOU HAVE frame of mind, since I HAVE so much. 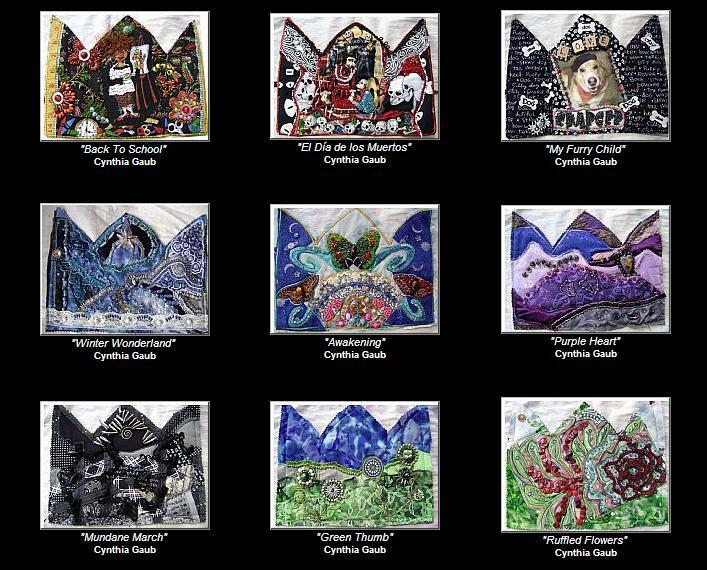 But I do want to have quilted text in my new series of work so I need to practice and experiment with the best ways of sewing in words. The text that is sewn several times is “Digging in the dark earth” and will be part of my just starting Journey Series, this one about gardening. I printed several cursive style fonts in different sizes on paper in REVERSE, then layered that paper on the top, a felt center, with the printed fabric on bottom. 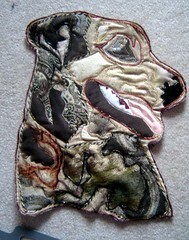 I then free-motion stitched this fabric sandwich using the bobbin method. The GREEN thread words are the ones in this fashion. WOW! it is very, very hard to sew backwards cursive! I still need a LOT of practice in free motion anyway, but trying to write script is pretty hard. The BLUE thread is when I gave up on the bobbin backwards style and flipped my fabric to the top. 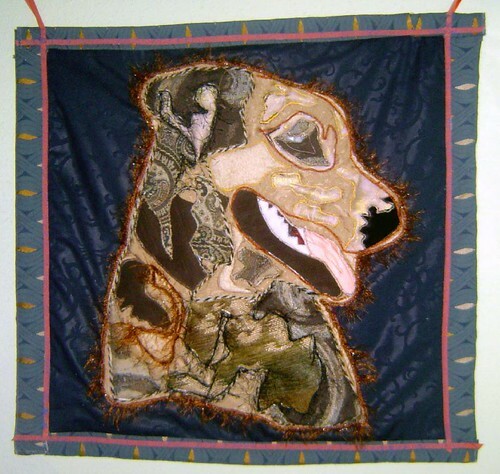 For one of these trials I wrote free-hand with a pen and then sewed over it. You can see the shadow of the ink, so if I end up with this method I will need to BUY some washout fabric pens or pencils… which I really need anyways to do some of the other quilting things I have planned. My final trial on this piece, I just sewed the words completely free-hand. (they go crooked at the end.) 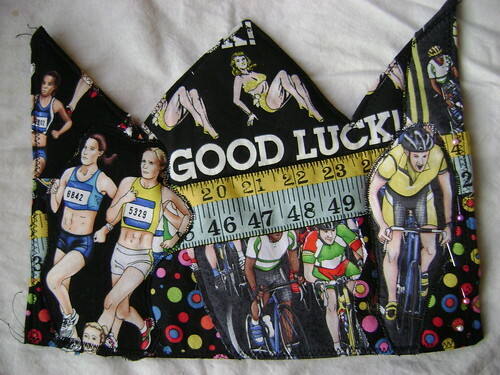 This has some possibilities, but I am most leaning towards the write with a washable pen and sew over that. I ALSO have letters that my sewing machine can do for me, so that was my next trial. (But it doesn’t really fit with the experiments in the book, just something I need to try for this series.) Finally, I wrapped up with a few practice free-motion flowers. So that is today’s experiment. I believe I will keep with about an 8×10 size for these experiments and put them together in a fabric journal with a printed copy of my blog notes on the process. This entry was posted in Fiber Goodness, Jen's Challenge 2008 and tagged challenge, collage, experiments, Fiber Goodness, free-motion, quilting on June 5, 2008 by Sheba. 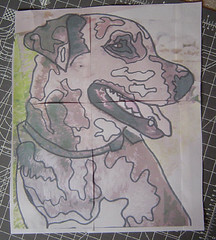 Step by step making a dog protrait for EBSQ Pet Swap. 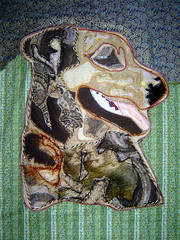 This entry was posted in EBSQ, Fiber Goodness, Pastimes, WIP and tagged dog portrait, EBSQ, Fiber Goodness, quilting, sewing, WIP on July 17, 2006 by Sheba.